Remembering 4-H History. . . .
A program on “Early 4-H Clubs History” was presented at the June 15th Big Walnut Area Historical Society meeting at the Myers Inn. Suzanne Link Allen, advisor for 43 years and the presenter of the program, had some early 4-H Club members as guests. Long time club advisors Bill Thurston (58 years) and Donna Morton(43 years) added some of their early club memories. Pat Crowl Wise, 1944 news reporter for the Sunbury Oven and Thimble 4-H Club, read some club reports that she wrote for the Sunbury News. Polly Horn and Suzanne Allen, also Sunbury Oven and Thimble members, told some of their memories of the former sewing and cooking 4-H Club. Ken Crowl told of his Porter Township 4-H Club involvement. Thurston, Morton, and Allen are working on club histories of the oldest local 4-H Clubs. They are trying to determine the dates of the beginnings of the early clubs and the names of some advisors and members. They are hoping to put together an early 4-H club history to place in libraries and the Big Walnut Area Historical Society for preservation. 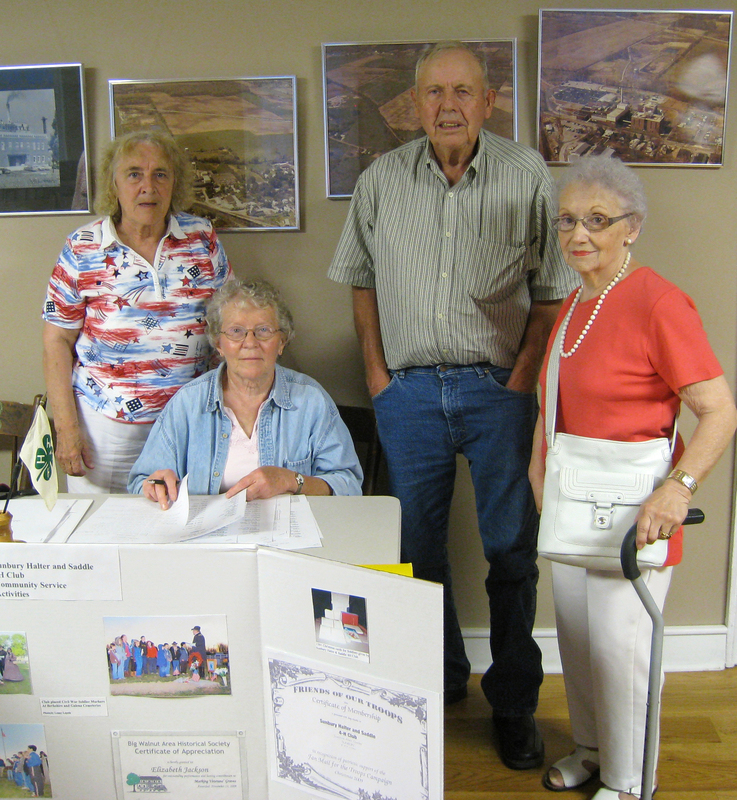 Allen told of her recent project of writing the history of the Sunbury Halter and Saddle 4-H Club and placing copies in the Community Library and the Big Walnut Area Historical Society collection. In 1902, A. B. Graham, Superintendent of Schools for Springfield Township in Clark County, Ohio, began a Boys and Girls Agricultural Club with about 85 children from 10 to 15 years of age attending the first meeting on January 15, 1902 in Springfield, Ohio. Within a few years, the name was changed to 4-H Clubs. The first projects included food preservation, gardening, and elementary agriculture. The next year the club members exhibited their projects at the Community Farmers’ Institute in Springfield. Three years later in 1905, there were 20 Boys’ and Girls’ Agricultural Clubs in Ohio. In 1908, the first 4-H emblem was developed. The three H’s stood for Head, Heart, and Hands. A fourth H was added and it stood for Hustle. In 1911, the Hustle H was changed to Health. The first Delaware County Extension Agent was Forest Ketner who started in the county on March 27, 1918. 4-H Club work started in the county in 1919 with 22 boys from various parts of the county. They decided on a purebred pig club with a show and sale at the Delaware Pumpkin Show held on the streets of Delaware. The club’s success was credited to E. O. Bolander. In 1923 in Delaware County, there were 4 clubs with 64 members owning pigs, calves and poultry. In 1923, the Ashley Junior Fair was recognized as the first junior fair in the country. It was started by vocational agriculture teacher, R. B. Warner. Delaware County 4-H members exhibited their projects at the Ashley Fair. The fair ended in 1949. About 1953, the Ashley Junior Fair award began with funds left from the fair and is still given to outstanding 4-H fair exhibitors at the end of the year advisors’ banquet. Early clubs organized by township and project type. In 1931, there were 20 4-H clubs in the county including 11 clothing, 2 food, 1 gardening, and 6 livestock clubs. From November 1931 to April 1936, there were no county agents and most records were lost. In 1936, there were 30 Delaware County 4-H clubs with 394 members enrolled. Numbers of girls clubs for clothing, food, and gardening, grew slowly from 19 in 1939 to 32 in 1956. Boys’ livestock clubs increased from 13 in 1939 to 22 in 1956. In 1957, 1104 boys and girls enrolled in 1676 projects. In the 1960’s as farm girls wanted to take animals to the fair, co-ed clubs became more common. In 2001, 1218 members enrolled in 3977 projects and 435 advisors kept 88 clubs going. In 2009, just in Delaware County, there were 75 4-H Clubs with 1200 youths and 320 adult volunteers. The volunteers contributed over 15,000 hours of time to teach life skills such as leadership, decision making, and communication skills through project work. 4-H members took over 3000 projects in 2009. In 1935, the Powell Hearth and Shuttle 4-H Club began. Members could exhibit their projects at the Powell-Delaware County Fair which began in 1909 and lasted until 1937. The Powell 4-H Club celebrated its 70th anniversary in 2005 and 75th will be celebrated this year. Bill Thurston was an Ashley Junior Farmers or Good Luck Club member in 1941 and Carl McCurdy, a club advisor, told that the club started in the 1930’s. From a list from the county extension office, Carl was listed as an advisor in the late 1930’s. In 1942, the Ashley 4-H Club had six boys including Bill Thurston (now a 58 year 4-H Club advisor), who spent the week at 4-H Camp Ohio. In 1942, the club was called the Ashley Good Luck Club and the Ashley Boys and Girls Club and in 1950 the Ashley Junior Farmers and Farmerettes but it was the same group of youth doing 4-H projects through those years. Add Thurston’s 10 year experience as a club member and he’s in his 68th year being involved with 4-H Clubs. From 1940-1964, Paul Cunningham was the County Extension Agent, who was also in charge of 4-H Clubs. The Cunningham Leadership Award has been given to outstanding 4-H leadership members since Cunningham retired. After researching the Sunbury Oven and Thimble 4-H Club and finding Pat Crowl Wise’s news reports from 1943 and 44, the beginning date of the club was a mystery. . Donna Morton found a county extension office list that had Mary Ellen Miller listed as an advisor in 1936, 1937, and 1938. By 1945, Miller was one of 13 county advisors who served more than five years. After Miller retired from the club, the group didn’t have an advisor. Trudy Ross and Allen rode their bicycles out Route 37 to talk with Catherine Wilson to ask if she’d be an advisor. Wilson recommended Neva Kintner and Lib Brenner. Kintner and Brenner were recruited as advisors and served for many years. The club met in the Town Hall and later in Big Walnut High School (now the BW Middle School). Members who contributed memories of their Oven and Thimble Club days were: Sherry Link Buel, Linda Link Wehrle, Beth Perfect Fouts, Polly Whitney Horn, and Rachel Cring Edwards. Rachel’s mother, Florinel Cring, served as an advisor until 1973, as did Edwards along with Gladys Hill and her daughter in law, Gladys Hill. Edwards believes the club ended after the death of Cring. More research is needed. Another early 4-H Club in the Big Walnut area was the Galena Happy Hemmers of 1944 with Louise Fissel as advisor. Donna Morton said that the present Galena Junior Homemakers 4-H Club is now 75 years old and Louise Fissel was an early advisor. Donna is researching to see if there was a name change from the Galena Happy Hemmers to the Galena Junior Homemakers. In 1936, a Mrs. Zimmerman was a Galena club advisor. Center Village Boosters and Center Cheerio Club with Harriet Mitchell, reporter and Kathryn Carr as advisor had 4-H Club news in the 1944 Sunbury News. Sunbury Halter and Saddle 4-H Club was actually started in 1951 as the Lucky Star Saddle Club but obtained the current name in 1952 when 4-H horse projects were started in the county. Kenneth Link, and Deb Edwards, along with Sherry, Suzanne, and Steve Link, were instrumental in starting the club which continues today. Highlights of the club’s activities from the beginning were: putting on annual horse shows at the playground (now J. R. Smith Park) taking annual club trips, participating in local parades, and exhibiting projects at the Hartford and Delaware Fairs. The club also had many community service projects through the years such as providing Christmas gifts for the Children’s Home in Delaware, taking fruit baskets to residents of the Hopkins House apartments (now Myers Inn). Starting in the early 2000’s, the club has done a Community Service project each month of the 4-H year. Allen told that a lifetime of 4-H experiences (10 years as a member) and 43 years as a 4-H Club advisor taught her the valuable qualities of leadership, citizenship, responsibility, and achievement. As a result of those experiences, Allen wrote the history of the club in 2009, Sunbury Halter and Saddle 4-H Club 1952-2009. Copies can be found at the Community Library. A big thank you goes to The Sunbury News and Community Library for preserving all the early newspapers containing the history of 4-H in the clubs’ news reports.